WordPress is the most popular blogging platform on the internet, but its quite expensive for beginner to start a blog on WordPress, but Blogger is almost free by all means. There are so many beginners and professionals who love Blogger instead of WordPress and I am one of them. But blogger has certain limitations and blogger is not as easy as WordPress because Blogger by default does not have attractive widgets. And that's why I started this blog to help beginners. Social Media has taken the internet to the next level and one of the easiest way to promote your article, blog or blog posts is by sharing it on social media. When anyone say the word 'Social Media', our mind automatically determines two big social media sites, Facebook and Twitter. Facebook is the largest social media platform followed by Twitter, so its always important to have massive Facebook fans with you. That is the reason why, today I will show you how you can add a Facebook popup like box widget in your blogger blog to increase your fan following on Facebook. There are so many Facebook popups for blogger but this one is the best in my opinion, because its clean and looks professional and one more thing about this widget is that its almost similar to the WordPress popup like box, which makes it more attractive. So lets begin the tutorial but see the demo first. 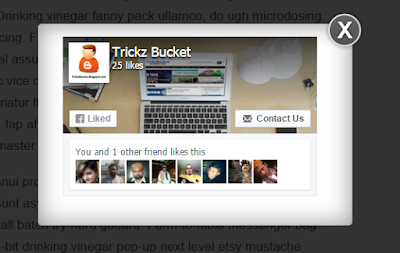 Replace TrickzBucket with your Facebook page username. That's it! You have successfully added Facebook popup like box in your blog. This is one the best Facebook widgets and I am sure it will increase your Facebook fans. Enjoy blogging and leave your comments below and share your precious thoughts with me and don't forget to share this article with your friends.